Crack a Smile... and More! (1996) Crack a Smile... and More! Singles from Crack a Smile... and More! Crack a Smile... and More! is the fifth studio album from the American hard rock band Poison. The record was released on March 14, 2000. The album features guitarist Blues Saraceno, who was hired as the band's new lead guitarist following the firing of Richie Kotzen in late 1993. Saraceno appeared on the band's last album release Poison's Greatest Hits: 1986–1996 in 1996, which featured two new tracks with him on lead guitar. Those two new tracks re-appear on this album along with thirteen new songs and five bonus tracks. The album moved around 12,000 copies in its first week of release to debut at #131 on The Billboard 200 album chart. Crack a Smile, while replete with guitar performances comparable with those on Poison's previous studio record, Native Tongue, contains few traces of the seriousness of that record. The life cycle of Crack a Smile, which began in 1994, was brought to an abrupt halt in May 1994, when vocalist Bret Michaels lost control of his Ferrari. Michaels suffered a broken nose, ribs, jaw and fingers, and lost four teeth. After his recovery, the band continued recording in 1995. However, to the group's dismay, Capitol Records had by this time decided to put the album "on hold", and instead released a Greatest Hits record in 1996. It was not until March 14, 2000 that the record was finally released. The album's eventual release was prompted by strong fan demand, with promotional copies and bootlegs selling for $50 or more. In order to compete with the bootleg release, Capitol took the unusual step of throwing in additional bonus tracks to the album. The bootleg version of the album contained the original 12 album tracks, 6 songs from Poison's MTV Unplugged performance, and their cover of the Kiss classic "Rock and Roll All Nite." The final version of the album, titled Crack a Smile... and More!, contained the original 12 album tracks, two studio outtakes, one unnamed demo, "Face the Hangman" (previously released only as a B-side on European singles for "Every Rose Has Its Thorn"), and four of the songs from MTV Unplugged. Saraceno was given considerable creative freedom and his writing and performing contributions dominated the album. The album's studio tracks were recorded at Devonshire Studios, Hollywood, California. Saraceno plays on these new songs (tracks 1-15), and original guitarist C.C. DeVille plays on the remaining bonus tracks, which are tracks recorded before this time. 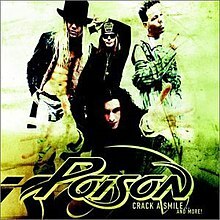 The songs "Sexual Thing" and "Lay Your Body Down" were first released on Poison's Greatest Hits: 1986-1996 album as bonus new tracks. "Shut Up, Make Love", which is the first single presented to radio stations, is a raunchy party anthem. "Be the One" (second promo single) and "Lay Your Body Down" are classic power ballads. "Best Thing You Ever Had" brings harmonica and piano to the forefront, while guitarist Blues Saraceno lives up to his name on "Mr. Smiley" and "That's the Way I Like It." The band goes all-out punk on "Doin' as I Seen on My TV," returning to vintage Poison on "Sexual Thing," and "Baby Gets Around a Bit". It also delivers an inebriated version of Dr. Hook's "Cover of the Rolling Stone." C.C. DeVille - acoustic guitar (bonus tracks 16–20 - recorded earlier). ^ "Sludge Scan For March 2000". 2015. ^ "Living Legends: music info on Poison". 2011. Archived from the original on 2011-10-05. ^ "Poison Greatest Hits review". Allmusic. Open Up and Say... Ahh! "Nothin' but a Good Time"
"Until You Suffer Some (Fire and Ice)"
This page was last edited on 26 February 2019, at 14:24 (UTC).